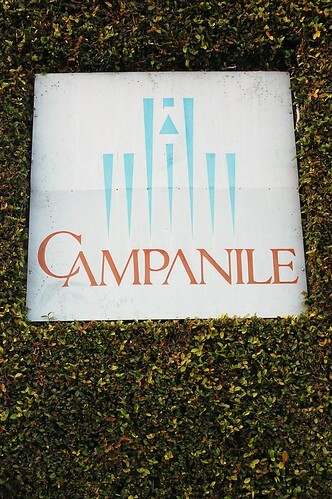 Campanile has been an L.A. staple since 1989. I waited for my old gang at the bar. 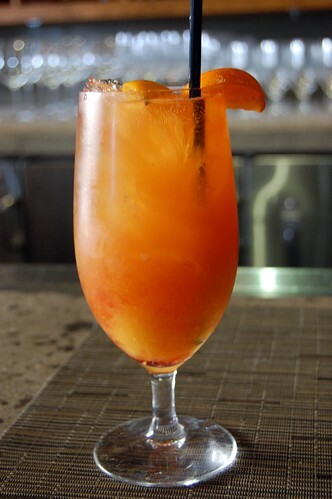 I asked the bartender to make me something fruity and tart. I felt like a creepy coug sitting there drinking by myself. I was thrilled when my three favorite boys from my old firm arrived. Time to eat! Time to catch up! Time to laugh and laugh and laugh! 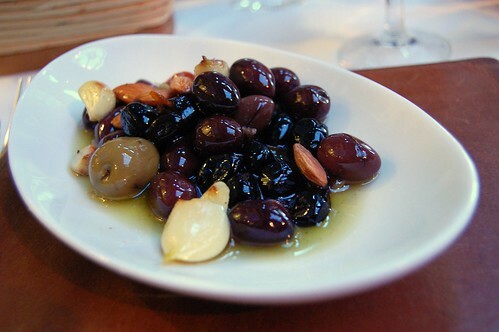 Marinated olives, roasted garlic, and Marcona almonds ($7). Thursday night at Campanile is Grilled Cheese Night, and April is National Grilled Cheese Month, so we shared a couple of sandwiches as starters. 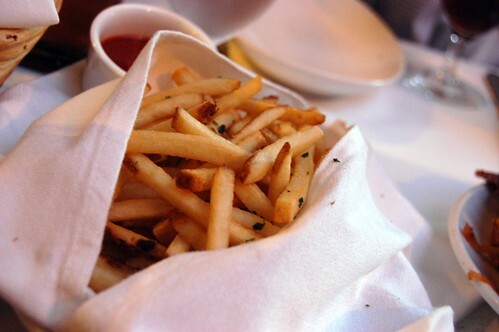 They came with these heavenly fries. 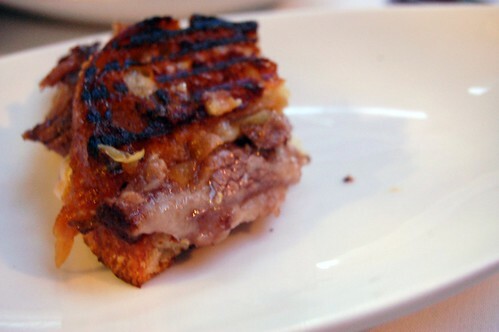 The braised short rib, caramelized onions, mustard, and Gruyère ($17) was fabuwonderrific -- an amalgamation so great it deserves its own amalgamated adjective. Not to be outdone, the fresh burrata, cherry tomatoes, chickpeas, serrano ham, and parsley pesto ($17) was splendimagitastic. Take a bite, and the cheese stretches out between you and the sandwich. I want to come back and eat every single grilled cheese on the menu. 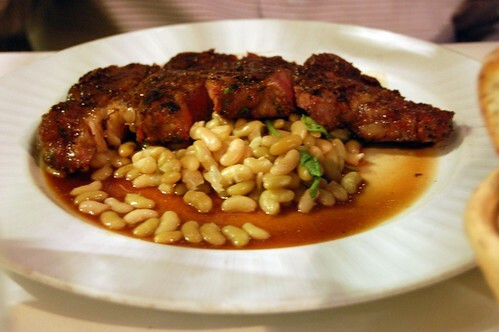 BPLJ and Pescado both got the grilled prime rib with flageolet beans, bitter greens, and green olive tapenade ($38). The bite I had was a little morsel of tender joy. 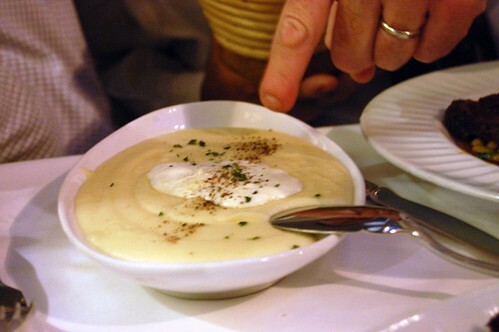 They also split some mashed potatoes with shallot crème fraîche ($8). 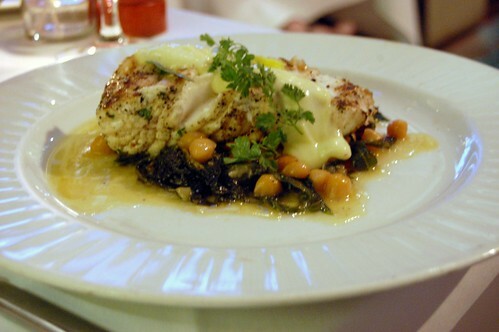 B-Dawg noshed on grilled Alaskan halibut with garbanzo beans, dandelion greens, piquillo pepper, and aioli ($28). 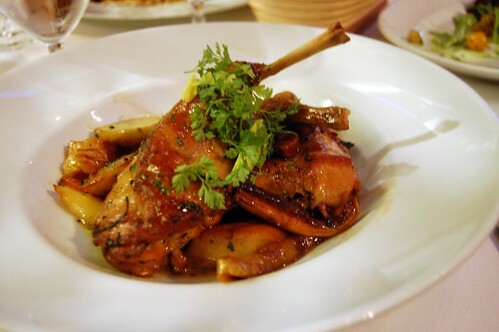 I loved my braised rabbit leg and saddle with glazed turnips, parsnips, carrots, and fingerlings ($28). Tender fall-off-the-bone yummers. It made me so hoppy. Har har har. B-Dawg passed on dessert, but the rest of us indulged. 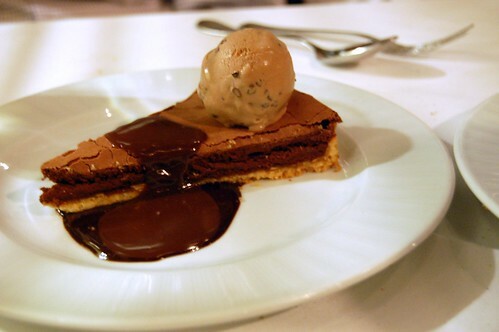 BPLJ chose the chocolate tart with milk chocolate sauce, glaze, and cocoa nib ice cream ($12) -- a perfect ending for any chocolate lover. 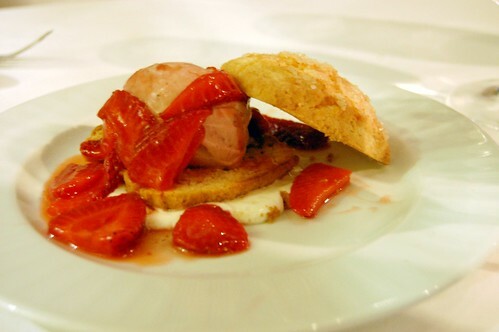 Pescado had the strawberry shortcake with macerated strawberries and strawberry ice cream ($12). Pleasant. 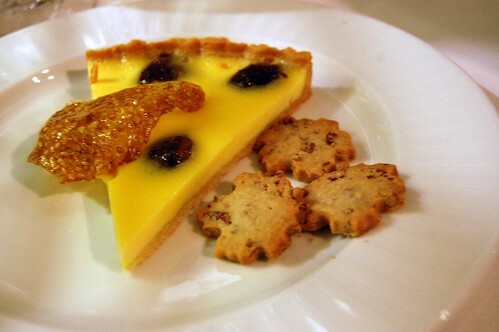 I was the winner with my honey date custard tart with maple pecan cookies and sesame brittle ($12). I couldn't get enough of it. Very special stuff. When I got home, my stomach hurt. It wasn't the food. Good food, good friends, good times. Always. I want to swim in those mashed potatoes. The whole meal looked divine. 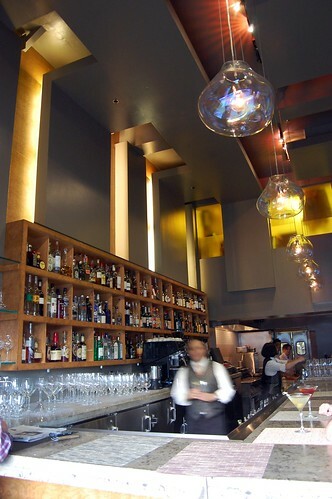 gorgeous restaurant-- love cheese, especially burrata! I am so hungry after seeing these photos! 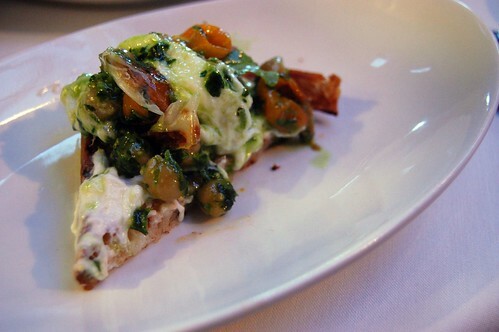 I'll have to try a burrata grilled cheese, maybe this weekend. and i like how you role, ordering gourmet awesome looking grilled cheese sandwiches as your app. Creepy cougs do NOT do that, i'm guessing. "splendimagitastic" = best word ever. 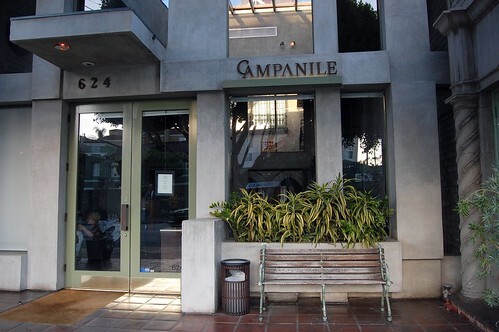 Many moons ago, I lived 2 blocks from Campanile but was too poor to dine there as frequently as I would have liked. It was a very "special occasion" place for me, and this post makes me want to eat there right now. Amazing meal! still love this place.. ESPECIALLY for brunch (even if Ms. Silverton has been gone for years).. when the lights coming down, hitting ALL the food perfectly, and I get to keep the ISO @ 100 for all the shots. i'm drooling all over myself over here. 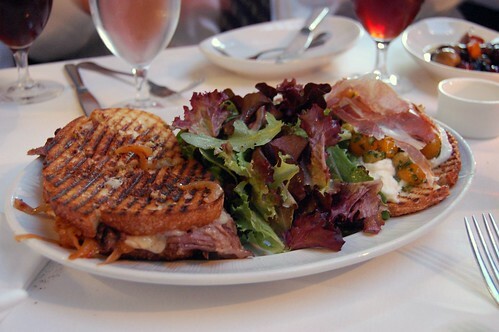 I want to go back and eat all the grilled cheeses on the menu too! i also once sat at the bar alone waiting for friends like a creepy old coug. but with a glass of wine. Grilled cheese night at Campanile is the best thing ever. Try the sliders next time - they're pretty spectacular, too. You could not be a coug if you tried. I'm having severe grilled cheese envy. That's why boys are suc good dining buddies--they don't mess around! Girls would've started with salads. Grilled cheese month? Yum for serious. The food looks so good it hurts. Yum! Have always wanted to go there for Thursday night grilled cheese! I've been wanting to try their grilled cheese night. Everything looks delish. I want to lick my monitor. "Creepy coug". Ha!! Where do you come up with these things? I've never been, although I've always wanted to. GAH! 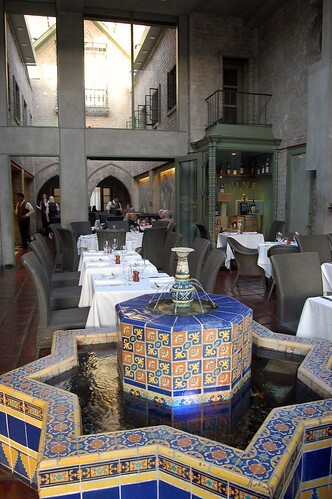 I haven't been to Campanile in forever, but these pics definitely encourage me to make a trip before I leave town.